details please go and visit the lovely Linda. so it did not cut out the whole note card, aarghh! made on the first one, so this is it! Now I am looking forward to seeing the next challenge on Monday. Love the colours and how the charm sort of pops out! You´ve made the background yourself?? Oh Maz its gorgeous, and what a fab charm. Enjoy the weekend. This is beautiful! Love the charm. It may have been frustrating but it was worth it. What you have created is beautiful. I love the image and words and background. I love this piece, Marlene! And glad to hear that you've been able to get away for a little while. Don't you love fall break here in Arizona? My boss's daughter was out of school so they went to Canada this week and our office was closed. It's back to work on Monday! Marlene, I'm so happy you were able to fit in the CCC after your vacation, and I hope you had a great time with Mickey and the gang! Your card is gorgeous, and I LOVE the Art Nouveau image you used for the fragment! I'd never have thought you'd had any challenges making this at all. It turned out beautifully! I'm very glad you decided to do this one after all, cuz it came out Great! I love your background, and I love how the colours in the fragment pop out. Wow, you have created a stunning piece of art! Love your charm! I too took my sweet time doing this challenge. It just didn't appeal to me, time was short, etc etc etc. I love your piece. The colors are beautiful, and the charm fits perfectly. Maybe we'll see some Mickey Mouse in a future piece? It was pretty quiet around here this week with all the families gone for fall break - glad you took advantage of it. With no more kids in school - we sometimes lose track of the school calendar. They say low 90's or even 80's this week...Hurray. I think it turned out wonderfully, Marlene! Love the image you used under the fragment. Really complements the background. Can't wait to see what you do this week. 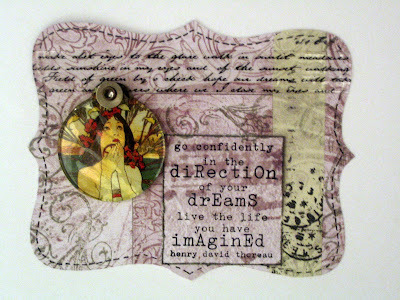 I love how you have used the paper and the charm is gorgeous, it just comes alive with colour. Thankyou for visiting me and leaving a comment - I really appreciate it.